So back in February I attended a talk by Adam Wathan at Sunshine PHP entitled “Applying the Ruls of Simple Design Principles“. I have been programming for 32 years (if you count moving the turtle around in logo). Usually at conferences I gravitate toward whatever architecture/concept/framework is the new hotness, so I was expecting some sort of new way to make coding simpler. When I got out of the talk I had learned nothing new. And it was Awesome! What I really liked about Adam’s talk was that it just reminded me about what good code looks like, and how to keep it looking good. There was nothing in his presentation that you wouldn’t learn in the first week of Computer Programming 101, but it was such a good reminder about how to keep things simple. 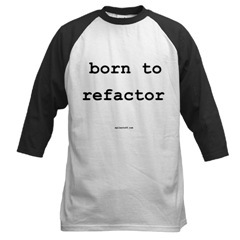 And I think the most important thing I got out of it is don’t be afraid to refactor. I never write crappy code to begin with. It is all pure and sleek and beautiful. But then some complication comes in and it gradually gets crappier and crappier. What Adam re-inspired me to do when this happens is to not be content with this degradation, but as complexity grows refactor. And the best way to not fear refactoring is to have good tests. I liked the talk so much I decided to re-talk it for my colleagues and here are the slides, and here is the presentation.